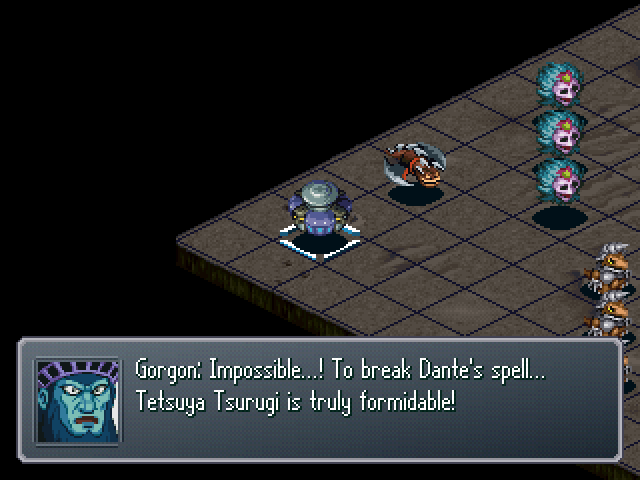 In order to get the Skill Point for this mission, I have to destroy Dante. 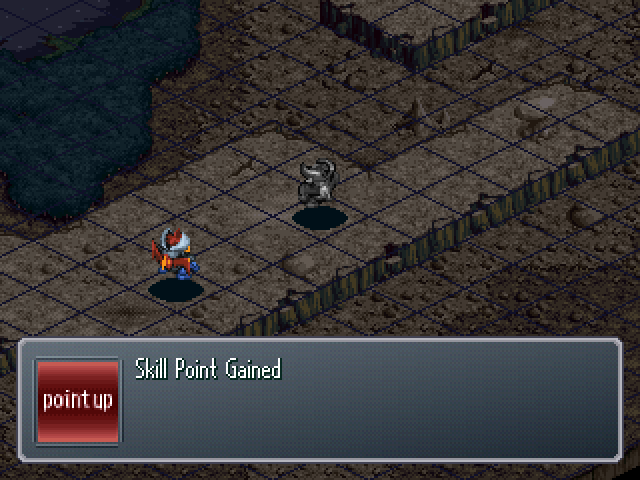 Make sure that Kouji uses Guard, because if his health goes into the red, than you miss out on getting the Skill Point. : Goddamnit! Why should the Mazinger brothers have to fight each other!? 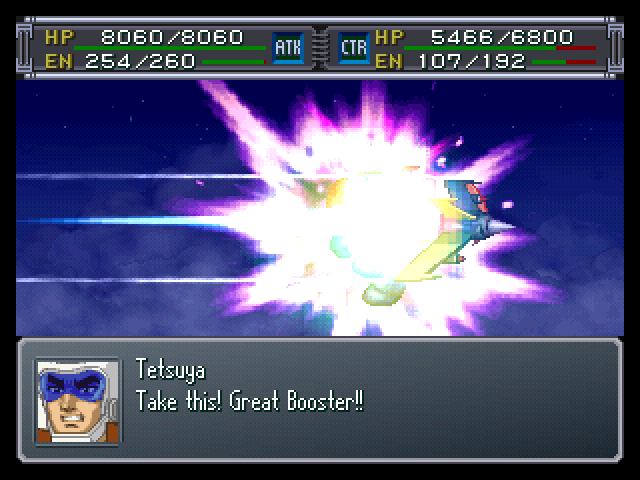 Tetsuya will always use Great Booster here, and it's part of the reason as to why you want to use Guard, because by now you know from experience how dangerous that attack is. 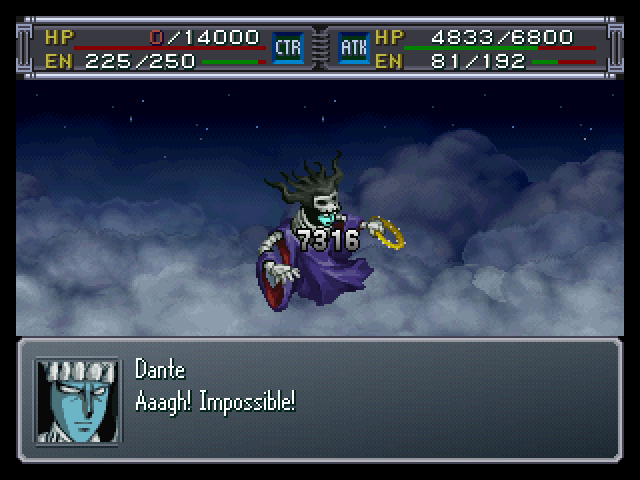 Next turn, a Valored Breast Fire takes care of Dante. 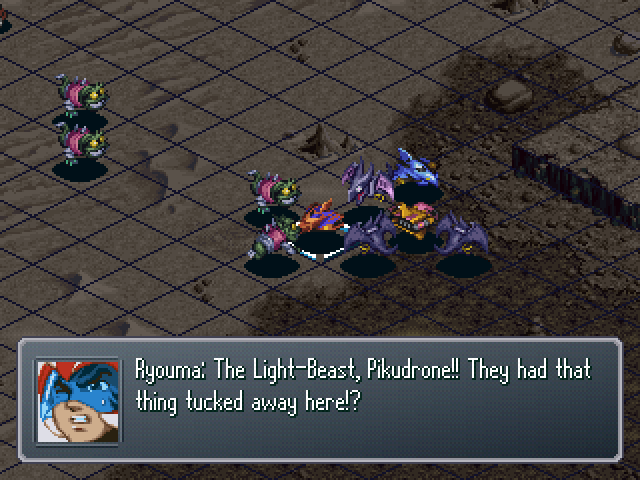 : C-curses! 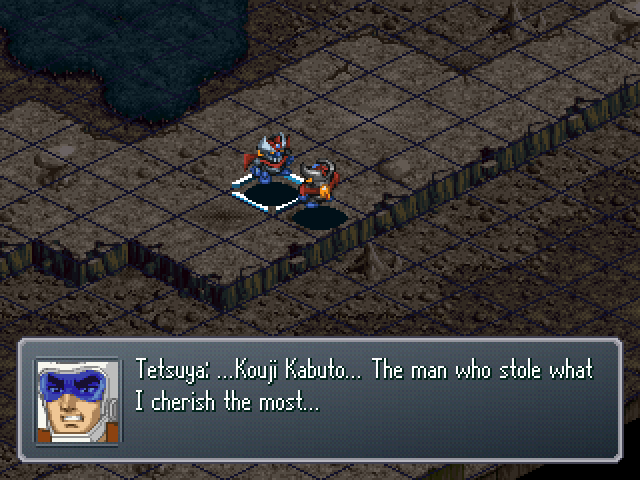 But even so, Tetsuya Tsurugi's heart has been overcome with hatred... Kouji Kabuto! 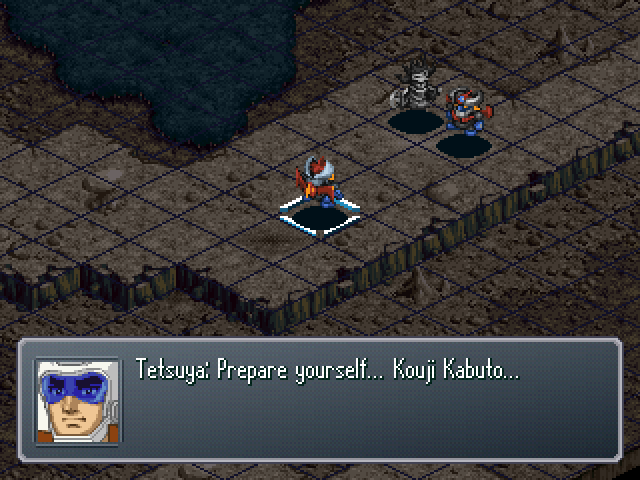 You will die here, by Tetsuya Tsurugi's hand! 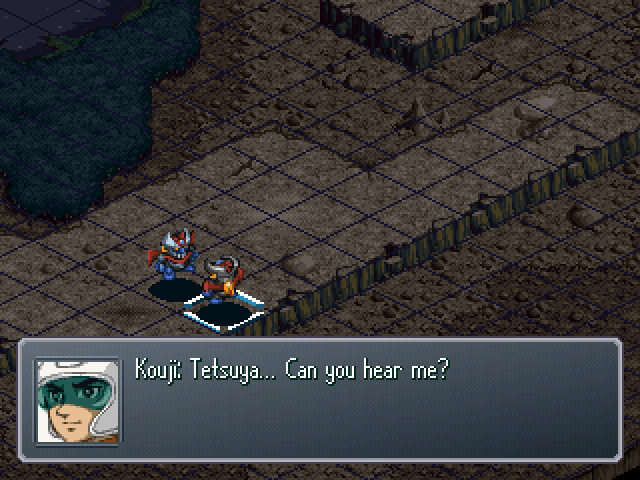 Kouji moves next to Tetsuya. 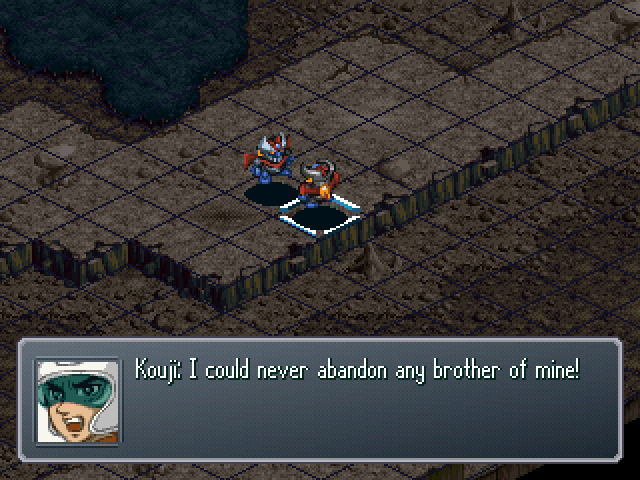 : Get away, Kouji! Tetsuya is still...! : Damnit, it didn't work!? : Looks like it's kill or be killed. We'll have to take him down...! 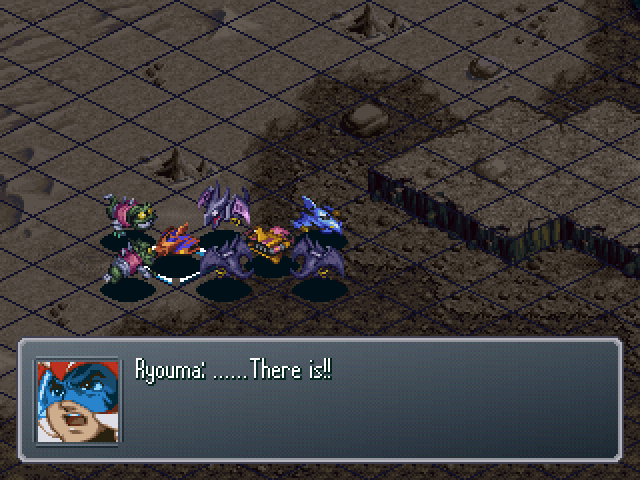 : Ryou! Look at the reality of the situation! Is there any other way!? 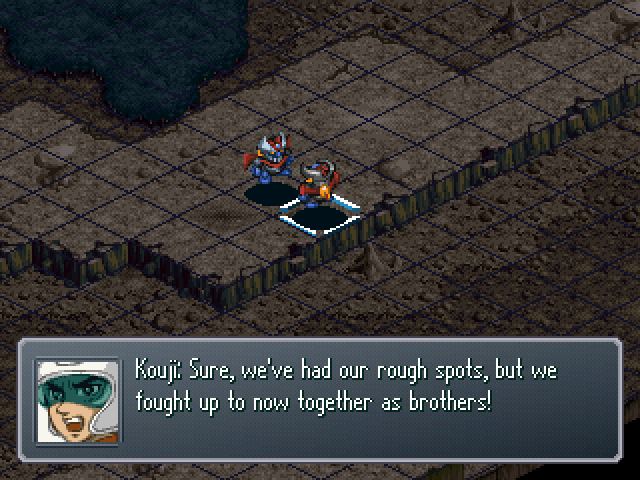 : But, Kouji still isn't giving up! : ...T-Tetsuya... It's not like you to let someone else manipulate you...! 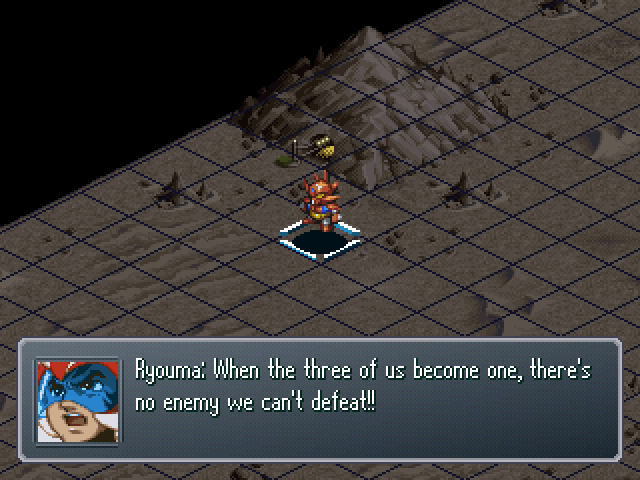 : ...I'll crush anyone who stands in my way! : Tetsuya, please, snap out of it! : ! What do you mean by that!? : If you hate me that much, shoot me! If it means getting your sense back! 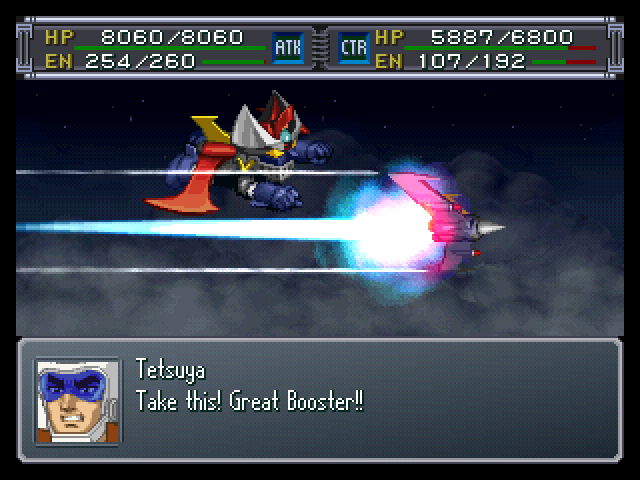 : Mazinger Z and I have owed you our lives since we first met! 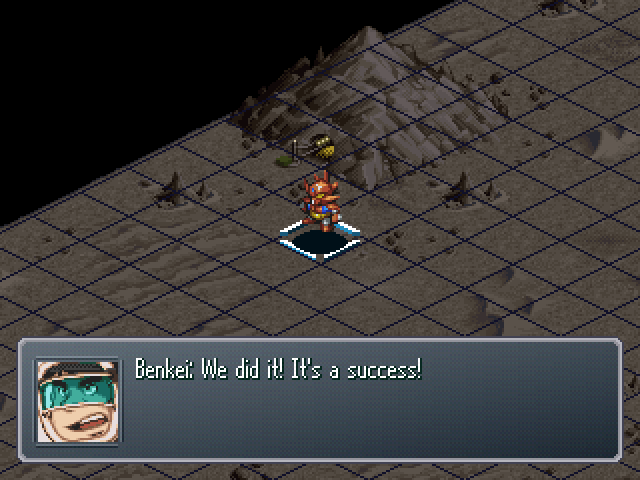 So now I'll repay you for saving us back then!! 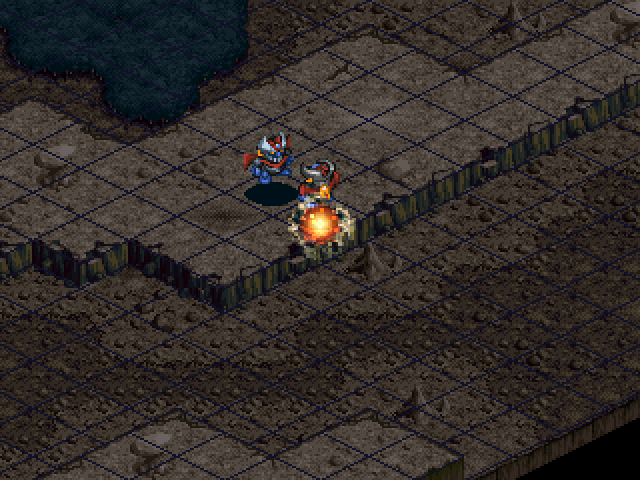 : Come on, if you're gonna shoot, get it over with! Get back to normal, Tetsuya! : ...I... I can't... 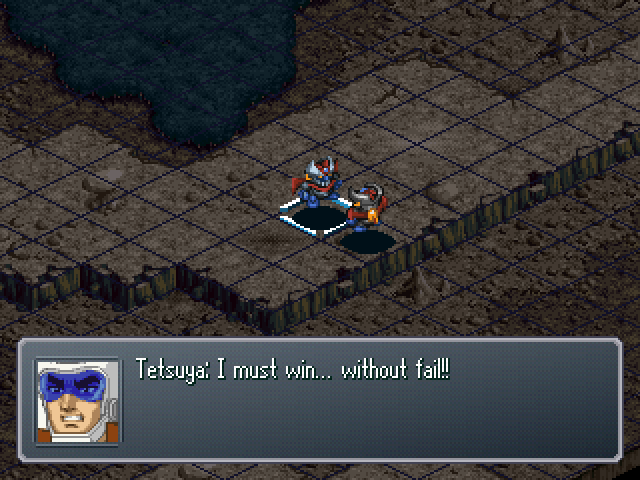 I... can't afford to lose... After all the training I've been through for this... 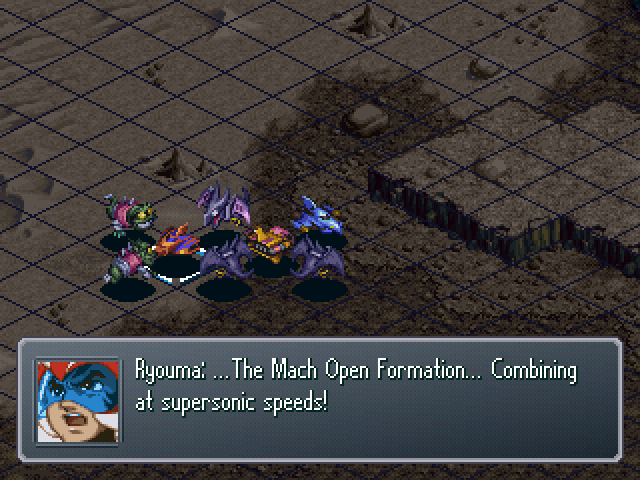 Even against the mightiest of foes... My own weak heart... I-I must...!! 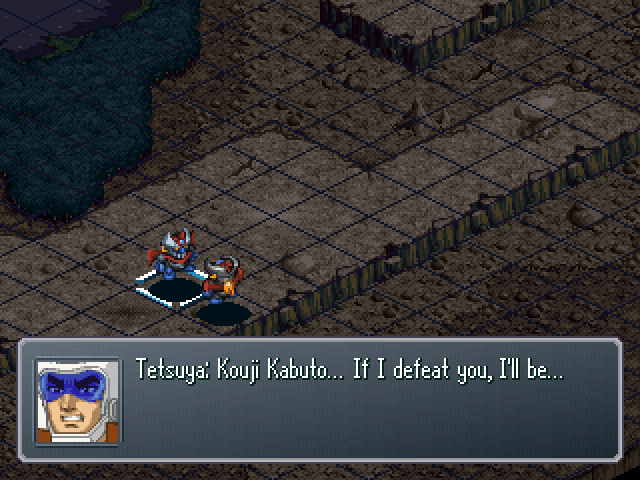 : Tetsuya... You're back in control of yourself! 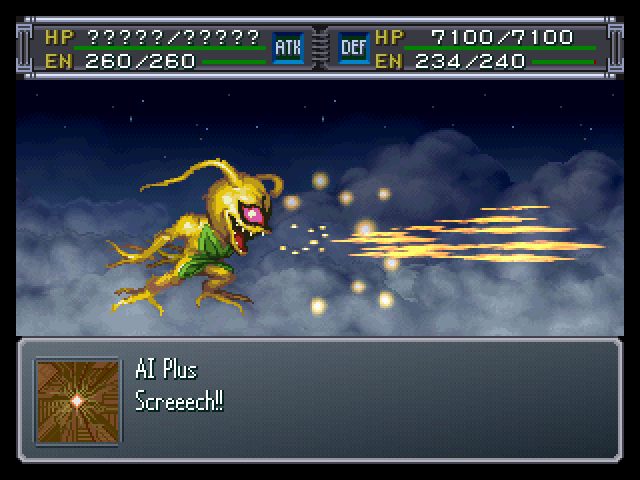 : Curses! 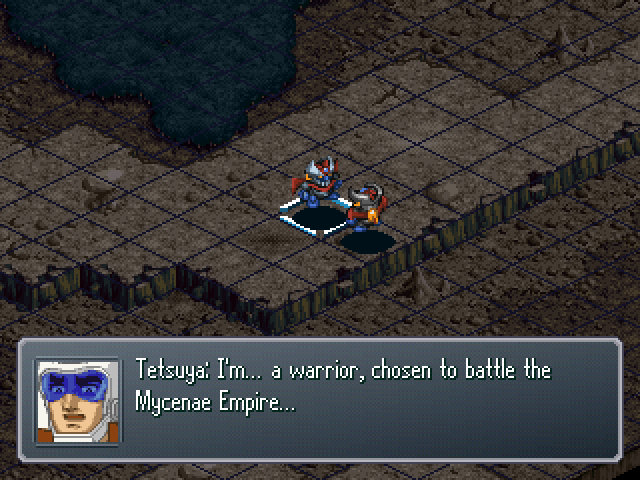 If it comes down to this, I'll have to resort to my trump card! : Hahahaha! 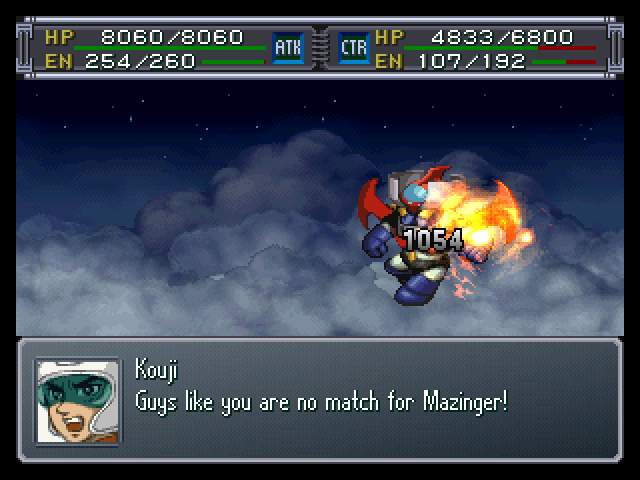 Two damaged Mazingers and Get Machines don't stand a chance now! : This time, you're going straight to Hell! 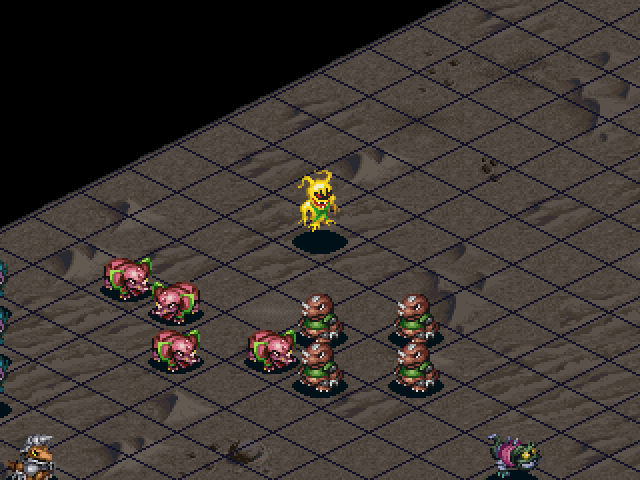 All forces, attack! : In your dreams!! I'm not about to bite the dust in a place like this!! 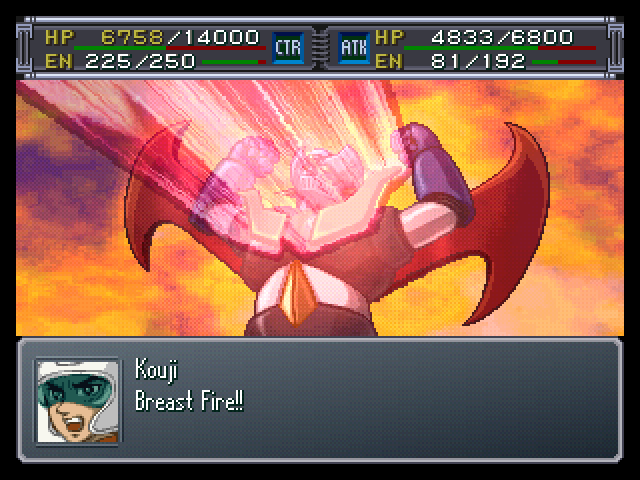 : Kouji... I'll repay my debt to you back there with my life. : What!? And throw away the life I went to all that trouble saving just now!? 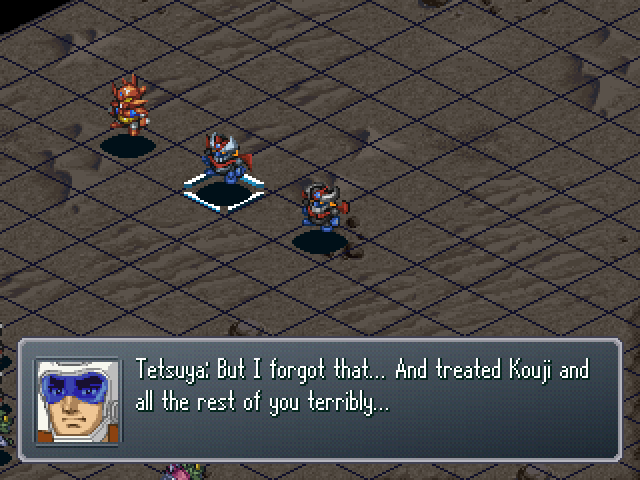 : Kouji, don't worry about me! I have to make up for all that I've done! : You think I could just abandon you, Tetsuya!? : Nobody would grieve...!? Don't be so stupid!! : Argh...! 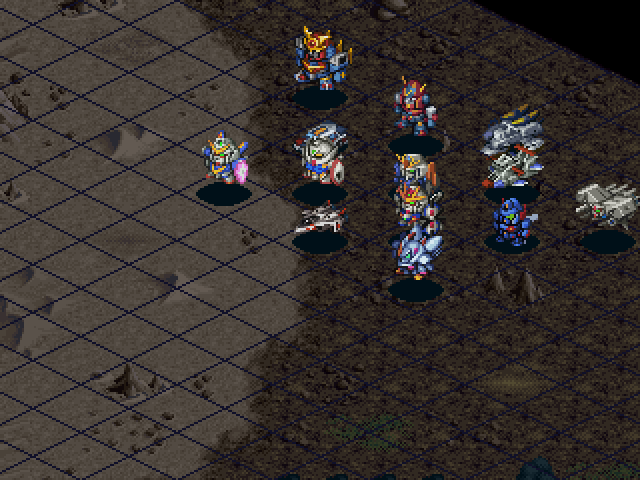 If only we could combine into Getter...! 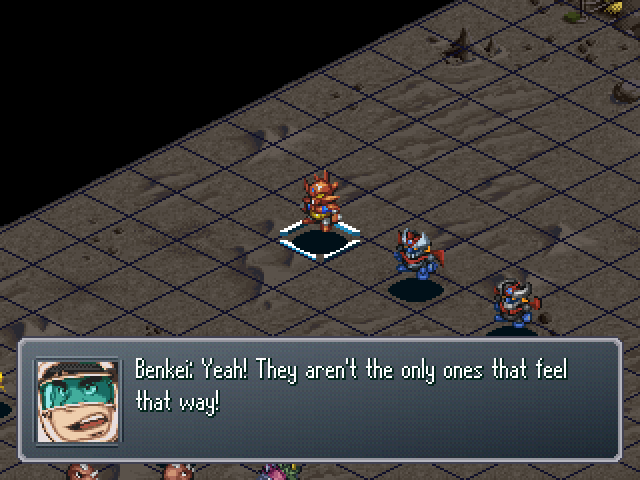 : Benkei... Sorry for what I've put you through lately. : What are you bringing that up for at a time like this, Hayato!? 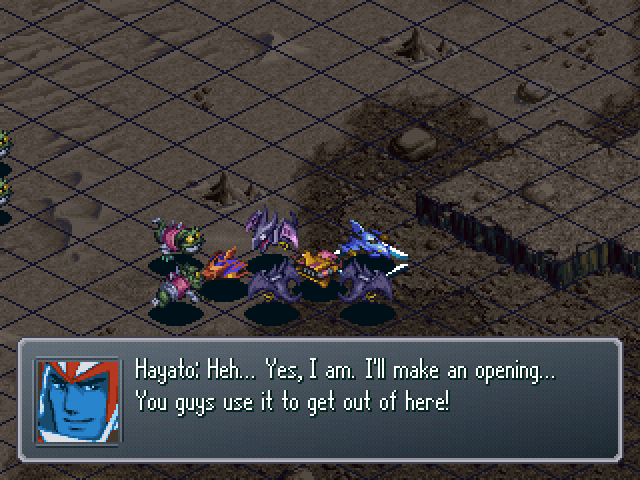 : Hayato... You're not going to!? : Don't be ridiculous! Do you want to die!? : As long as we can't combine, all we're doing is dragging the others down. We'll all die at this rate. It's better to at least save two by giving up one. 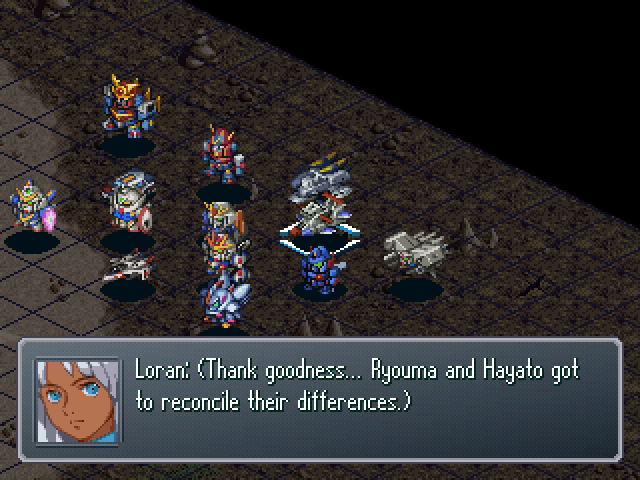 : Hayato... 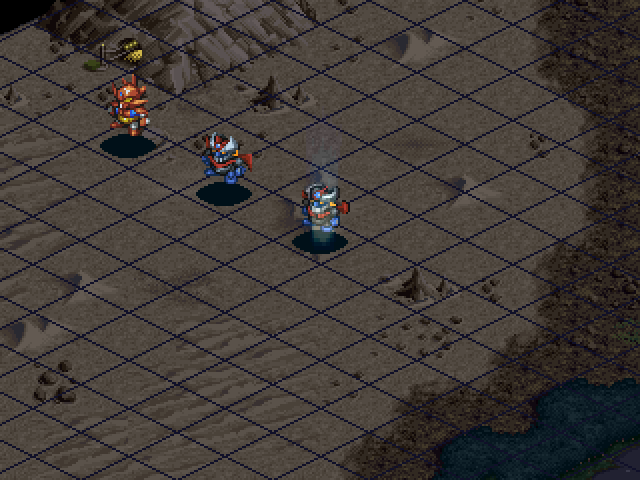 I will absolutely not permit that sort of tactic! : But is there any other way for us to get out of this? : N... But, we haven't tested that out in anything but training! : We've got to use it! We'll shake them off with that, then combine at once! : If we fail, colliding at supersonic speeds would mean the death of all of us! In which case, it'd be better for me to...! Click here to see what they can do in 0.01 seconds! 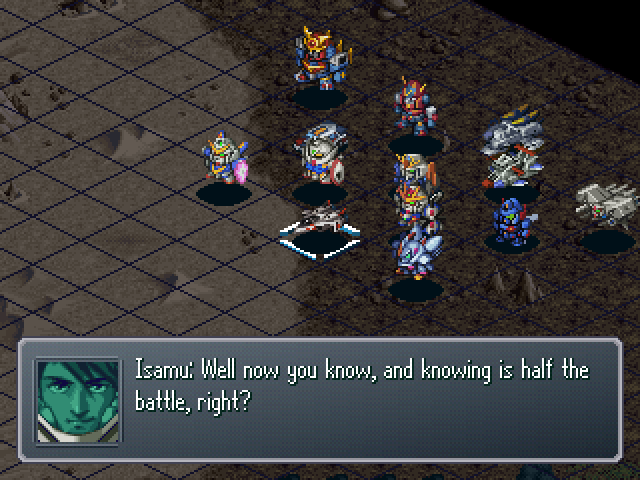 : Heh... Had me on pins and needles for a moment there. 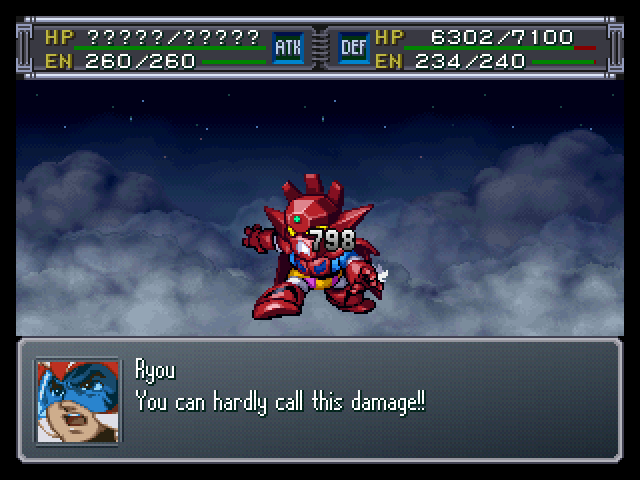 : Cursed Getter Robo... It broke the impenetrable special assault formation...! : Gallery... If you underestimate our strength together, you're in trouble. : Yeah! 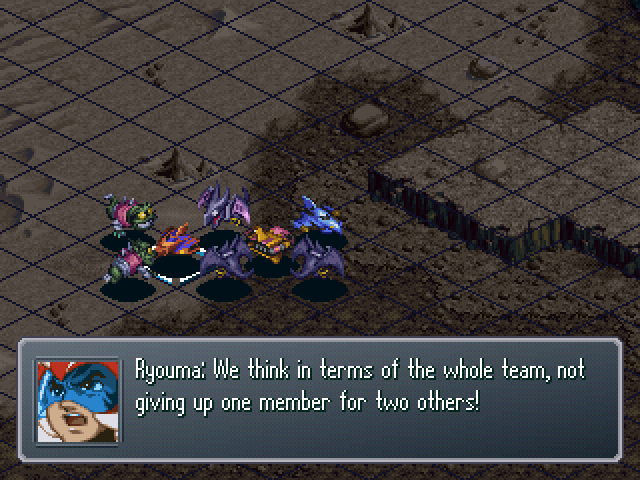 You'd better remember, our teamwork is invincible! 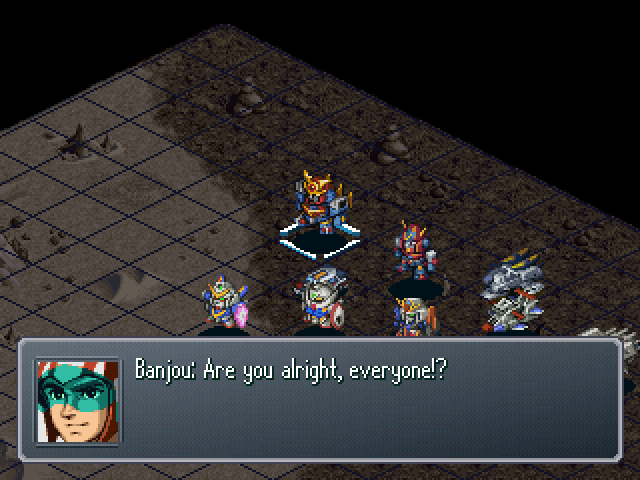 : Alright, Kouji! Let's join in! 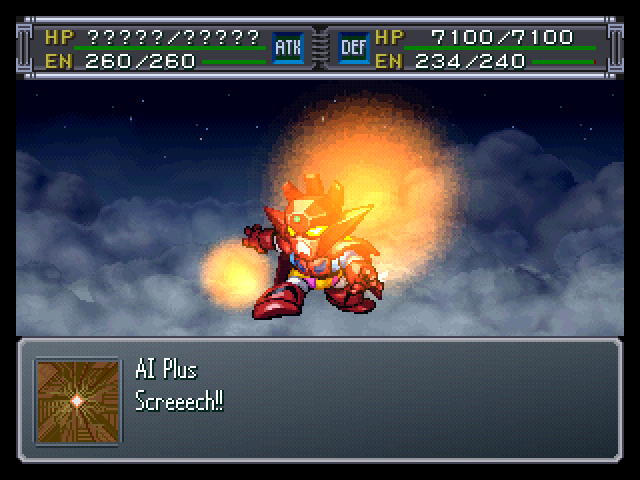 And so Getter Robo, Great Mazinger, and Mazinger Z all have their HP, EN, Ammo, and SP restored, as well as having their Will become maxed out! 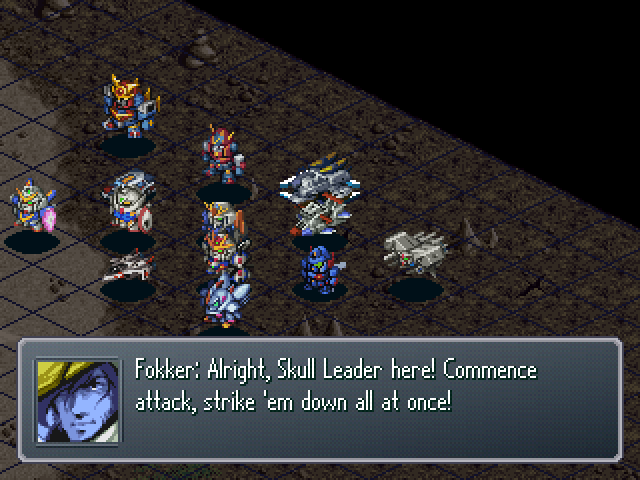 : Argh, all forces, GET THEM! 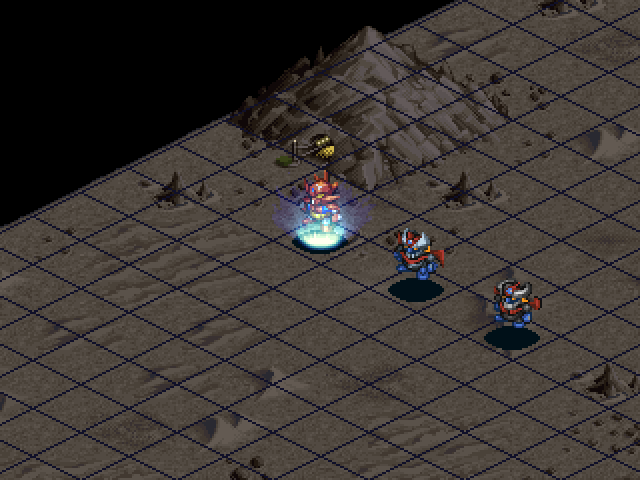 Pikudrone is the only one to attack us as our forces close in on each other. 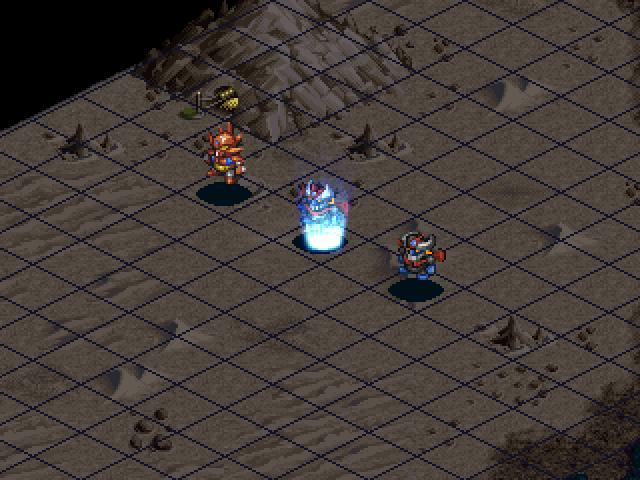 At the beginning of the next turn, The rest of our forces arrive. : Check it out! 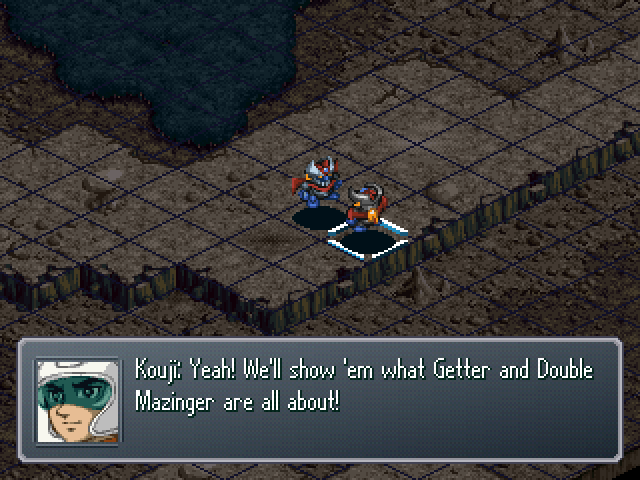 great Mazinger's with 'em! : ...So you've finally cleared up all your worries, huh? : There's no use bitching and moaning over past screwups, Right, Guld? 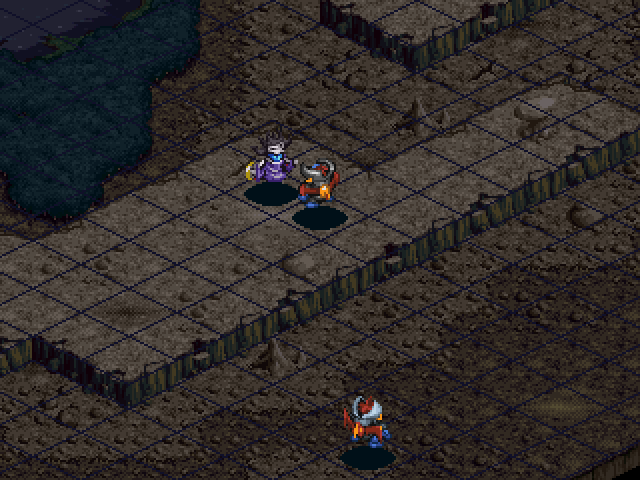 : Well, let's mop up the enemies here first, they look like they're out for blood. 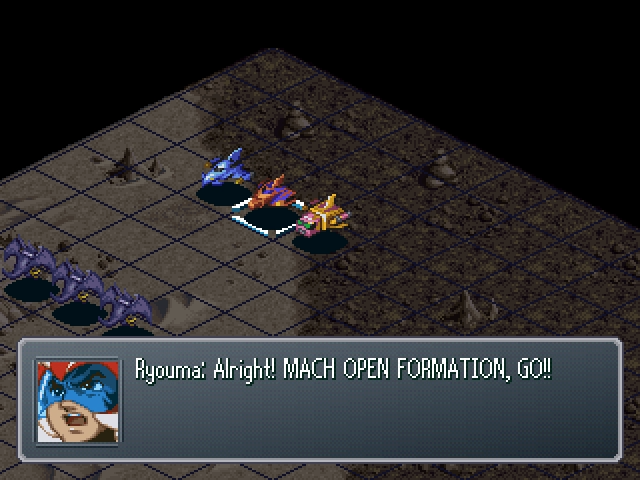 : Ryou, you're in command! : Leave it to me!